Today’s IT executive must master a new set of capabilities focused on areas that are generally not part of traditional IT governance. For today's IT executive, the job has never been more difficult. The solution? Mastering a new set on capabilities focused on areas that are generally not part of traditional IT governance. Is enterprise IT spinning out of control? It would be an exaggeration to say so. But it’s certainly true that the days are long gone when a central IT department was able to control all aspects of its company’s systems, applications, platforms and devices. Indeed, the locus for decision making about business applications is shifting inexorably to line executives. That can be a good thing from the standpoint of speed to market and becoming more agile in responding to opportunities. But from the standpoint of traditional IT governance, it’s a bit overwhelming. Ensuring compatibility and integration and avoiding redundancy are now harder than ever. And it becomes difficult even to identify and manage IT spending. Requests and IT capabilities are now buried in different budgets all over the organization, not in a central IT budget. As a result, IT executives are having a harder time than ever delivering on their traditional charge: maximizing the return on technology investment and controlling spending, while providing the global enterprise with a coherent, integrated IT architecture and management structure and also securing the company’s (as well as its customers’) data. The battle continues, nonetheless, between centripetal and centrifugal forces: IT executives want to retain some sense of standardized and centralized control. At the same time, almost unstoppable forces are spinning IT capabilities out toward the farthest reaches of the business. What’s needed is a way to keep things spinning into control by somehow harnessing that energy while also avoiding a descent into chaos. The centrifugal forces pushing IT capabilities out to the business are fueled in large measure by two major IT trends: the consumerization of technology in the workplace and the growth of cloud computing. In 2011, the Accenture Institute for High Performance surveyed more than 4,000 employees in 16 countries and found that more than half (52 percent) are using personal consumer devices for work-related activities. An almost equal number (50 percent) are taking it upon themselves to create technology-based solutions to meet particular business needs. And then there is cloud computing and software-as-a service, which give business or line personnel the ability to bypass the IT department and go directly to service providers for the applications they need. The implications of this trend can sometimes be exaggerated—for example, that it’s now easy to tell a provider how many software licenses are needed, download an application and get to work. Or that it’s common for business managers to pull out their credit cards and purchase a few hours of server time from an infrastructure cloud provider. The reality is that it would probably be career-limiting for a business manager to make a major IT purchase without the sanction or knowledge of the IT group. However, it is undeniable that the ready availability of applications and infrastructure on request has made the business more involved than ever in building IT functionality. 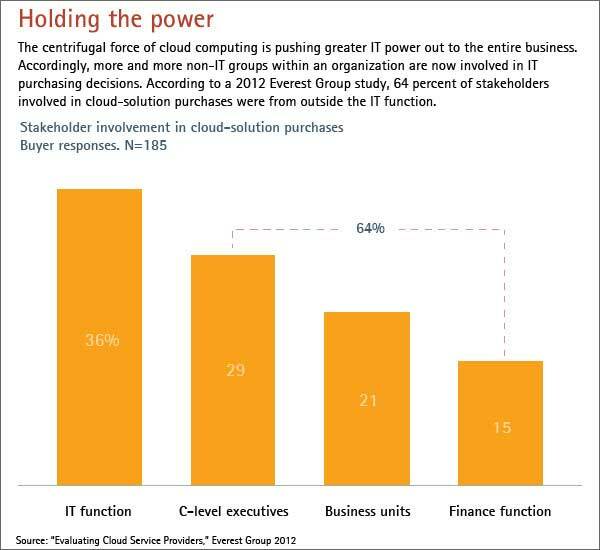 Indeed, a recent Everest Group study found that 64 percent of buyers of cloud solutions were business or line function managers and executives rather than from the IT function itself (see chart). The advent of the cloud signals significant changes in functions and roles for internal IT. For two decades, IT has been evolving from a back-office technical function into a service-oriented provider that delivers critical business capabilities and is managed by business and technology leaders as a strategic business resource. A much-touted purpose of outsourcing, and now of the cloud, has been to accelerate this process, freeing up internal IT resources for more business-focused and strategic tasks. But how can this complex environment be more effectively managed? Cloud computing and the consumerization of IT have the potential to create great value for organizations in every industry. Employees can work from anywhere and can meet customer demands or respond to operational needs as if they were at the office. Businesses can reduce costs, create more agile IT capabilities, simplify procurement and accelerate the delivery of IT functionality on behalf of the business. At the same time, organizations now need to think in new ways about how to manage IT in a coherent, comprehensive and cost-effective way, making technology, application and business services choices with a clearer eye on business value. So what’s needed to more effectively manage this new and more complex IT reality? The very term IT “governance” may be outdated. Note that in an automobile engine, a “governor” is something that exists to limit the power and speed of the machine. It’s about control. What’s really needed today is a way to increase speed, not throttle it, to manage IT toward greater efficiency in its new role as a service delivery function. And that requires a set of capabilities focused on areas that are generally not part of traditional IT governance. But given these new governance requirements, where will the required skills come from? Research from the London School of Economics and Accenture—based on a survey of 414 business and IT executives—found that about three-fourths of business executives intend to rely on their in-house staff for IT services. But those same executives also expect to make much more use of external services as reliance on the cloud grows. IT executives are looking, perhaps not surprisingly, primarily for technical support. About 50 percent of them recognize the benefits of external providers for technical assistance—things like IT configuration and integration, data security and data management. But about half of the business executives surveyed see a broader role for external providers to drive activity in areas such as business process transformation, change management, communications, and IT maintenance and support. The move to IT as a function that delivers business services—and not just application creation and support—has many concerned about whether they have the skills internally to make that happen. In short, the move to IT as a function that delivers business services—and not just application creation and support—has many concerned about whether they have the skills internally to make that happen. Our research shows that CIOs and other IT professionals often lack the deep knowledge and experience to move decisively into cloud computing. In practice, this knowledge gap appears to be a major reason for organizational delays in moving to the cloud. What retained capabilities will be needed to run the technology function? How does the changing and expanding role of external providers play into the mix? What specific management capability challenges are coming to the fore with cloud deployment and a plethora of new consumer devices in the workplace? And how can these be dealt with? In the following sections, we will look at the new picture of IT management, with a focus on the skills organizations need to execute these functions more effectively. A value creation function—which in some cases is an actual responsibility, akin to a program management office—works in concert with the business to assess and realize value from an IT initiative, drive innovation and provide an enhanced level of insight for stakeholders. To have such a value creation function means there is a part of the IT organization that is proactive from an innovation perspective, providing ideas back to the business. It also means that function is working closely with the business on pilots and proofs of concepts. IT organizations in general struggle to develop such a capability—in part because of capacity issues but also because many of them are not adept at the kind of strategic thinking needed to really drive this function consistently. Rapid technology change and the almost continuous release of application updates are other factors constraining the ultimate creation of business value in partnership with IT. In some cases, a SaaS platform may release dozens of enhancements every quarter. One high-tech firm has ended up, like many companies, opting out of most software releases because it simply cannot cope fast enough with the impact of a release on the normal functioning of the business. This firm recently activated one piece of functionality within its SaaS platform—functionality that had been available for a couple of years—and found it to be highly valuable. But the situation also represented a missed opportunity (or delayed value) because the situation made it clear that the IT function did not have people tasked with being on the lookout for the most important value creation opportunities in new releases of the software. Business innovation. Turning to the essential skills needed to successfully develop and run a value creation office, “business innovation,” not surprisingly, is at the top of just about every IT executive’s agenda. The changing role of the CIO is one thing to be taken into account here. The impact of the cloud is likely to split the CIO’s responsibilities with regard to innovation: a role focused on business innovations, and a more technical role looking for innovations in architecture, infrastructure and delivery. The business innovator role is especially important in an environment where external providers, other vendors and the in-house IT function need to work together. Collaborative, dynamic innovation is one key success factor identified by our research when it comes to both IT outsourcing and BPO. So an important responsibility of the business innovator is to maintain the organizational commitment to collaboration necessary to leverage the cloud’s full business potential. Business systems thinking. All of our research respondents stressed that cloud management requires a high degree of other business-facing skills. One such skill is what we call “business systems thinking.” Business systems thinkers focus especially on aligning strategy, structure, people, process and technology. Our cloud research emphasizes that business systems thinkers need to be deployed on cloud projects, where they can act as conduits between business demands and the technical architects. Relationship building. Another important capability is relationship building, which facilitates the wider dialogue and establishes understanding, trust and cooperation among business users and technology/cloud specialists. Relationship builders develop users’ understanding of technology and the cloud, as well as the potential the cloud holds for their lines of business. The architecture of IT solutions designed to deliver business services in an effective and efficient manner will increasingly involve hybrid environments of both legacy and cloud. But even that does not capture the full complexity as, in reality, an effective solution now may need to include various flavors of cloud: private cloud, managed cloud, virtual private cloud and public cloud. To meet this solution design challenge, a business architecture capability is required—one that pools resources and provides expertise across key business functions and delivery needs. The principal challenge with this capability is to translate insights into technology, suppliers and business directions that help the IT function and the business design more agile solutions that can accommodate technology change. By developing this flexible and anticipatory capability, the organization can more consistently operate based on an effective and efficient technology platform, without needing large, ongoing investments in major migration efforts. Architecture planning and design. Both visionaries and the architects themselves are essential to the business architecture. Planners shape the technology architecture and infrastructure by developing and maintaining the overall vision of an appropriate technical platform. They also create policies that ensure the necessary integration and flexibility in technology and cloud services. 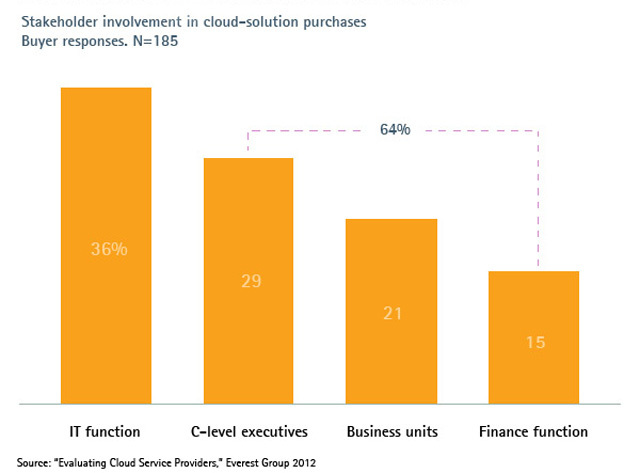 However, when it comes to the cloud, our respondents suggest that the architect capability is especially important. The cloud architect has to be an enterprise architect, a service-oriented architecture (SOA) designer (because most cloud-based solutions use a services architecture) and a cloud technologist. By tracking technology trends, and then by understanding the business and the technical configuration required to optimize operations, the business architecture capability ties together cloud strategy and existing technology, and develops the coherent blueprint to manage the ongoing IT journey. Making IT and process work. An important skill for those in the business architecture function is the ability to make IT and process work. This isn’t as self-evident as it might sound. Technology “fixers” are needed to troubleshoot problems and identify how to address business needs that cannot be satisfied adequately by standard technical approaches. These fixers understand the idiosyncrasies of the inherited infrastructure and business applications, enabling them to make adjustments rapidly. In outsourced environments, these skilled resources also assess and challenge third-party suppliers’ claims about technical problems and proposed solutions. Technical staff need a deeper understanding of their traditional core competencies and also a wider skill set to overcome traditional IT silos and address the fact that the cloud encompasses more than one technology. Instead of employing multiple people to oversee storage, networking and virtualization, companies might hire one person whose skills span all three cloud competencies. Service delivery is where the nitty-gritty of traditional IT development and management happens: infrastructure design, configuration and development, release management, testing, support and much more. In essence, this function is responsible for the actual delivery of business services via the IT platform and then for supporting that platform as it evolves. The service delivery environment today is highly complex in part because, as noted, the architectural environment is more complex—a hybrid of legacy and cloud technologies. Delivery will also most likely be a mix of multiple resources both internal and external. In response to that complexity, there is a growing need for management skills outside the traditional sweet spot of IT managers. Service integration. With IT focused more today and in the future on delivering business services rather than as a function that delivers applications and server management, an unprecedented degree of business sophistication is now required from IT. This business knowledge, combined with systems integration capabilities, results in a new function providing end-to-end management and integration of the business service or set of services in a multi-vendor, cloud environment. Service integration combines into a new capability several traditional functions including service transition, service operations and continuous service improvement. Informed buying. For organizations that rely heavily on external vendors and outsourcing providers, an informed buying capability is critical. Informed buyers analyze and regularly benchmark the external market for IT and cloud services; select the five- to 10-year sourcing strategy to meet business needs and technology issues; and lead the tendering, contracting and service management processes. The cloud also requires the ability to source different technologies and services from a multi-supplier base, on a more dynamic basis—one that is frequently on a pay-for-use and pay-as-you-go basis—as well as on more traditional outsourcing contracts, and shaping the integration of multiple services for the business unit customer. In a world that gets increasingly outsourced and cloud-sourced, we find that client organizations still under-resource their informed buying capability. Contract facilitation. This action-oriented capability is crucial for creating a smooth relationship between suppliers and business users, in part by ensuring that problems and conflicts are resolved fairly and promptly within what are usually long-term relationships. In many of the companies we have studied, the need for this role is not spotted soon enough, especially when it comes to IT outsourcing. Instead, the capability tends to grow in response to ongoing issues: Users may be highly demanding, which incurs additional charges from a provider; multiple supplier services need coordinating; or easier monitoring of usage and services is required. Contract monitoring. This involves making inputs to the development and maintenance of a robust contract as the basis for sound overall management. The role then leads to holding suppliers accountable for both existing service contracts and the evolving performance standards of the services market. Although all the organizations we have studied recognize the importance of contract monitoring—the monitoring role is routinely staffed at the beginning of an IT outsourcing arrangement—they too frequently assign this role to people with inadequate knowledge and experience, underestimating the magnitude of the task. The cloud brings a new dynamism to the monitoring role because there are more (and more diverse) contracts, more instant and transparent information (including from suppliers), new standards of service and a need for faster response times. Vendor development. This competency is concerned with leveraging the long-term potential for suppliers to add value, creating mutually beneficial situations in which the supplier increases its revenues by providing services that drive greater business benefits. Given the high costs of switching providers, it is generally in the client company’s interest to maximize the contribution from existing suppliers. This is likely to remain the case in a cloud environment, especially as such contracts grow larger and more complex. Our research points to two major challenges in developing the skills and functions needed to manage an IT environment in which the business itself—and employees—has a greater share of voice. One is the recruitment and retention of the highly skilled group needed to manage cloud-based services effectively. The other is evolving these management skills to support the expected increases in cloud deployment and external sourcing over time. Once technical reliability is established, the retained function needs to become more business-focused and better able to source externally. This makes relationship-building and business systems thinking capabilities especially important. Also, scaling up on external cloud-sourcing will usually necessitate increased investments in informed buying, contract monitoring and vendor development capabilities. Whatever the emerging pattern of take-up and speed of cloud computing, it is clear that technology continues to be both a challenge and a significant opportunity for organizations. Making the new IT environment successful requires a new set of management competencies. One paradox is that the challenges of technology have often blinded people to the real purpose of the technology function. The cloud offers a path forward. The more that specific technologies get moved out of the way—into the cloud, to the supplier and to the business itself—the more the technology function can focus on its real job, which is to exploit the capability that IT makes available for business. Primarily, that job will lie in service, information management, business analytics and IT-enabled business innovation. Organizations must ensure they have the management capabilities in place to reap the full value of today’s IT. Saideep Raj leads Accenture’s global SaaS (Software-as-a-Service) business. He is based in Philadelphia. Jack Sepple is the managing director of Accenture’s cloud business. He is based in Denver. Leslie Willcocks is a professor of work, technology and globalization at the London School of Economics.